The Coen Brothers? I love the Coen Brothers! I’ve seen all their movies, some of them five or six times! OK, I haven’t gotten around to A Serious Man yet, but all the others? Absolutely! I even liked The Hudsucker Proxy! 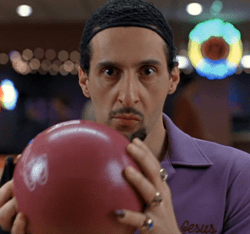 The Coen Brothers RULE! Usually when I don’t want to hear something I put my hands over my ears and go “Lalalalalalalalalalalalala…” but uring mass on Palm Sunday did not seem like the time or place to do this. I just sat and gritted my teeth took it. I had this happen once before in church. A priest was railing against the ending of Clint Eastwood’s Million Dollar Baby, which he described in perfect detail for those in the congrgation who had not seen the film. People like me. Well, now I know exactly how A Serious Man ends, just like I know how Blood Simple and The Big Lebowski end. I still enjoy seeing those — but the difference is I didn’t know how they ended the first time I saw them. Look: I really appreciate using cultural references to make a point during the homily. It livens things up and makes your sermon much more interesting and accessible. But please, no more movie spoilers at church. I’m quite sure Jesus would say that’s not cool. Did you complain to him or were you afraid of being struck by lightening? I almost said something on the way out, but I’m working on keeping my yap shut. Call it pilgrim’s progress. You could have retaliated by standing up during his re-telling of Jesus entering Jerusalem and telling the rest of the congregation the ending a week later. True, BL… but that’s another example of a story we know the end of and still enjoy every year. It’s like when they used to show The Wizard of Oz on TV once a year when we were kids. We knew the ending, but loved it anyway. Did I just compare The Passion to The Wizard of Oz? On Good Friday? Issuing an encyclical barring priests from mentioning the end of films less than 12 months after release might be just the thing to take the Pope’s mind off some other problems right about now. It’s a sled. She’s a dude. The bear wins. He kills them with DRANO. The albino did it. He and his son are aliens. He’s dead. They’re dead. Her father did it. The whole thing is a dream. He’s been dead the whole time. They blow it. They also blow it. They never find it. She never finds her Mom, either. He’s his father. Good thing he never slept with her. The tribbles are trouble. It’s prosthetic. He clears the shark. That reminds me of that one time I went to church on Easter and had the ending of “The Passion of the Christ” spoiled for me. By the by, “A Serious Man”? Incredible flick. And I’m glad to know I’m not the only TU blogger obsessed with the Coens. You should give the sermon this week, and make sure you weave the Easter Bunny into the plot. You know what never gets enough love, Miller’s Crossing. After I saw the picture for the first time, I left the theater and had dinner. But I found several of the images from the film were just etched into my brain. And I was compelled to go back later that evening to see it for a second time. That had never happened before, nor has it happened since. This was the exact reason I couldn’t see Shutter Island with the husband – he was out somewhere where someone basically did a line-by-line synopsis of the movie, and now he can’t get it out of his head. I’ll just have to wait for it to come out on DVD.